A former Corso chef pulls off an idealized vision of the neighborhood restaurant. 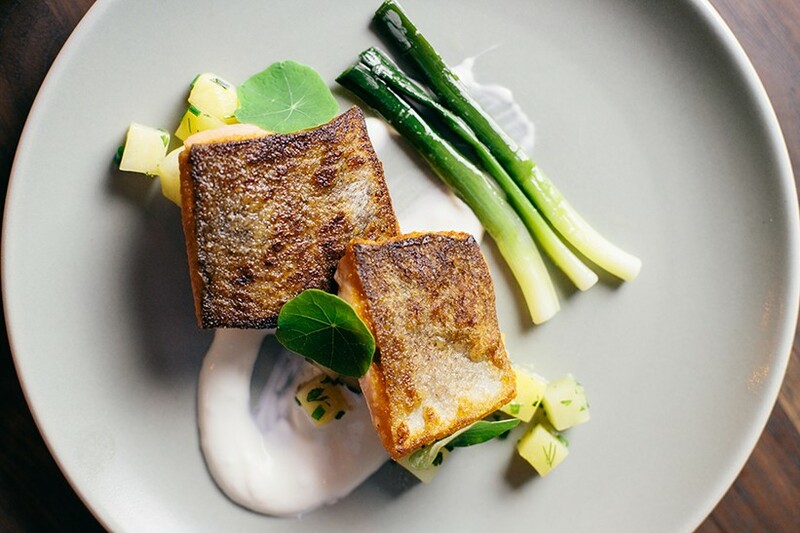 Trout with glazed root vegetables, leeks, ginger, and yogurt. There's something refreshingly old-fashioned about Juanita & Maude. At a time when high costs force East Bay restaurateurs to choose fast-casual models and the demand for convenience results in an increasing amount of effort placed on delivery options, Juanita & Maude feels like returning to the not-too-distant past, when diners judged restaurants equally for their food, service, and ambience. Opened in October just off Solano Avenue, the cozy, New American restaurant brings an unparalleled level of sophistication to Albany's dining scene. The food is worthy of a special occasion, but the relaxed energy makes it the sort of neighborhood spot that draws regulars week after week. Owners Scott Eastman and Ariane Owens are responsible for this balancing act. Owens designed the space, which manages to feel simultaneously classic, contemporary, and full of warmth. Executive Chef Eastman spent six years as chef de cuisine at Corso, the Michelin-recommended Italian restaurant in Berkeley. 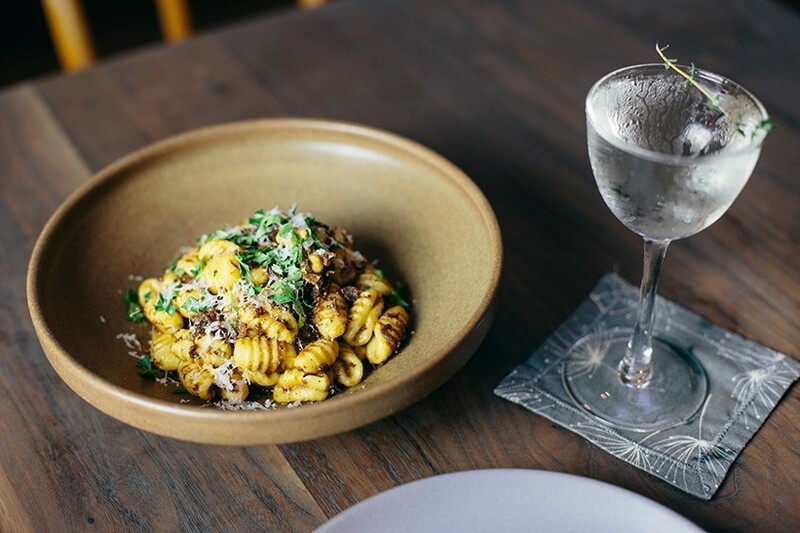 At Juanita & Maude, he breaks away from his previous confines of Northern Italian cuisine, incorporating Japanese ingredients alongside Eastern European traditions on a menu that changes daily. At the same time, he acknowledges his expertise, and the Italian dishes he does make are fantastic. Perhaps the best of them is the gnocchi, which are soft and light yet structurally sound. Even though Eastman isn't attached to keeping anything on his menu, he usually offers some preparation of gnocchi. On my visit, it was bathed in a deeply savory Umbrian wine sauce with pancetta and lots of black pepper. It showed admirable restraint, allowing the pillowy gnocchi to speak for themselves. The saffron-stained malloreddus showcased serious skill as well. Often called "Sardinian gnocchi," the toothy, hand-rolled pasta came coated in a rich lamb ragu with a subtle, warming bite from Aleppo pepper. There's often crowd-pleasing arancini available, too. I tried a version studded with broccoli, which, frankly, was undetectable under a blanket of rustic tomato sauce. Most importantly, though, the little rice balls were light, crispy, hot, and oozing with Taleggio. Eastman's more adventurous fare feels confident, too, and more impressive. I adored the pairing of roasted Brussels sprouts with smoked shiitake mushrooms, just-cooked butternut squash, crunchy farro, and pine nuts. Every bite carried texture and nuance, making it an exceptional vegetarian starter. (Juanita & Maude typically offers at least one vegetarian entrée and a few small plates.) Grilled Monterey Bay squid tossed with cherry tomatoes, cucumbers, ginger, avocado, and herbs was cool and refreshing on an unseasonably warm fall evening. Seafood is a notable strong suit. My favorite overall dish at Juanita & Maude was a remarkable black cod surrounded by plump mussels, smoky chorizo, and chickpeas. The cod, so buttery and delicate, tasted like a luxurious treat on its own, but the combination of a creamy aioli and an orange-hued sauce, infused with chorizo juices, paprika, and oregano, made it something I never wanted to stop eating. It's been replaced by another fish entrée, which I'm willing to bet is also wonderful. Malloreddus bathed in beef sugo, rosemary, and chili. Eastman also frequently throws an unapologetically old-school, generally unsexy dish on the menu, such as Chicken Cordon Bleu. I appreciate that Eastman doesn't try to reinvent these classics; rather, he just puts out darn good versions of them. I tried a plate of meatballs, mashed potatoes, cranberry sauce, and pickles and marveled at the simple comforts of something so expertly prepared. The meatballs, rolled from pork and prosciutto, were incredibly moist and fragrant with ginger, nutmeg, and allspice. It speaks to Juanita & Maude's overall concept. The restaurant is named after Eastman's grandmother and mother, and their framed black-and-white images seem to watch over the dining room. Sure, there are dry wood branches hanging on the walls as well, but in many ways, Juanita & Maude feels wonderfully anti-trendy. Here, classic comforts reign supreme. Of all the East Bay restaurants I visited in 2017, Juanita & Maude had the most consistently great service — an impressive feat considering it's still so young. Servers were easy-going, present, and knowledgeable. They clearly joined the restaurant with many years of experience and knew how to pace courses just so. Even though there are no tablecloths — and thankfully, no stuffiness, either — folks still rush over to replace a dropped napkin, change your silverware, or carefully sweep crumbs off your table. General Manager Nicholas Danielson, formerly of Corso and Rivoli, runs the room like a deft conductor. Hours: Tue.–Thu. 5:30–9:30 p.m.; Fri. 5:30–10 p.m.; Sat. 5–10 p.m.